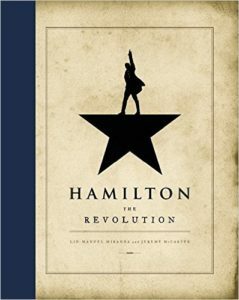 Being a theatre person, reading about the process Lin-Manuel Miranda and his team took to create this behemoth was fascinating. I got excited when they mention things that I know about (Logic Pro! I know what that is!) and the endless processes that need to take place. I feel a little bit of Alex Lacamoire’s pain as an orchestrator – I have to do almost the same thing every winter for the middle school musical. And the talk of lighting and sound and choreography – that’s a world that I love being a part of. I love the notes along side the libretto that give us glimpses into Lin-Manuel Miranda’s mind. He’s not shy about things he references, or things that inspire him. Harry Potter, Wicked, Steampunk, staples of the musical genre and rap and all sorts of things appear. Learning where his lyric and musical took him and why he made certain decisions is amazing. Beyond all that, the story of Alexander Hamilton’s life is amazing in itself. Where was this when I was in school? Looking at it as an educator, I can only get a glimpse of how this will impact history classes across the country. (Fun story – as a substitute in a sixth grade history class, the students had to write a break-up letter to King George III on behalf of the American people. Well, here’s his response!) Students respond and learn better when they are given a variety of tools to learn from. Music can make things easier to understand, and when lessons are presented in the style of music they enjoy listening tool, you have a winning combination. Very few people I’ve talked to don’t particularly want to see Hamilton. Two of them are my parents. They are both in their 70’s and prefer “traditional” musicals. I don’t think my mother has ever listened to a hip-hop or rap song by choice in her life. To be fair, their hearing is starting to go, and they have trouble understanding people when they talk or sing too fast. And they asked me the question: “Why is Hamilton so popular?” I had to think. There are articles everywhere trying to explain this very thing, and thousands of people who could voice their opinions. It is a story of America told in a way that humanizes the characters we read about in our history books. It is a story of us. And it is told in a way that is exciting and fresh and new. And like Hamilton changed the course of our nation, Hamilton has changed the course of musical theater. And we get to be in the room where it happens. Share the post "“Sometimes the right person tells the right story at the right moment.”"
Crystalclear can usually think of something clever to say, except when she can't. She has a giant stack of unread books at home but will always find an excuse to buy/acquire/borrow another one. I wish so so badly I could watch the musical, but there’s just no way. It’s far too expensive and tickets are too sought after now.